Whoops, it's been roughly one life-age of the earth since I last posted here. Been swept up in the heady glamour of Tumblr (for which read 'compulsive nerdery of Tumblr'). But I do enjoy my opportunity for rambling self-justification re. my visual choices, if just for my own reading, so HELLO again Blogger! Hi. 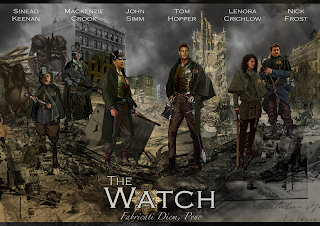 I made a pretendies poster for the Ankh-Morpork City Watch TV show that runs in my head (as opposed to the one that will actually exist within the next year or two by all accounts). It was a way to practice a different style of illustration for me - digital montage type of thing - because I wanted to inco-operate real life elements like actors faces. I was pretty pleased with the result in that department. It worked best in the top right-hand corner where the black-and-white turns into colour. And I think I caught something of the Ankh-Mopork I imgaine, even if it is in dragon-induced-ruins, by using medieval, 18th-Century Eastern European and early-20th -Century elements. My starting point was a screen-grab from Life On Mars, partly because I have now mentally cast John Simm as Vimes but mostly (and not coincidentally) because Life On Mars is a. ace and b. a major influence on my imaginings of The Watch on TV. So I tried to, what's the word, colour-time? the rest of the picture to have a 70s feel too. John Simm as Vimes... the name has come up in the fandom but he's not a popular prospective casting choice with fans. Most people go for Hugh Laurie and a few for Ben Miller. Both excellent and eminently sensible choices. But I was thinking about how you need more than a good actor who looks the part. You need one of those actors with a particular quality - I think of it as soulfulness - that means you look at his face and, though all the hijinks and fantasy - absolutely believe in what this character is feeling and thinking. Simm had that quality in Life On Mars, It was another 'high-concept' show where this empathy in the main character was essential. Laurie and Miller would give excellent, entertaining performances, but I don't think either could carry the show in the way Simm could. Also: solid-copper policeman called Sam who has a propenisty for dropping 30 years into his own past? He has experience in that role. Lenora Crichlow is another actor I'm pretty convinced about. For Vimes, you need an actor who's able to simply take what's on the page, and make it in a real-life person. For Angua, I'd choose someone who brings along a another - even contradictory - quality to the character as written. Angua is one of those characters who I like fine, but who has never become anything more than two-dimensional to me. I have same issue with Susan Sto Helit. Kickass, sure. Cool, plenty. But rounded...? I actually prefer Angua in the books when she's not the viewpoint character. When she appears in other characters' stories (e.g. when she turns up in Monstrous Regiment or Going Postal) she is enigmatic and no-nonsence. She comes across as Vimes Junior - cynical, clever, badass. When we see her thoughts they are pretty two note: a. werewolf angst and b. Carrot angst. Lenora Crichlow embodies such a warmth and likability I'd like to see her bring that to a character whose main notes are the aforementioned cynicism and angst. It's not that I think that the character needs to be softened, but just rounded out. Casting the right actor can turn a good character into a really good one. My other casting choices are more subject to whim. I'm very fond of Nick Frost, and, like Crichlow for Angua, I think he would bring an essential likability to Sergeant Colon. Colon's a character who is very sympathetic on the page, but might lose that quality when the narration is taken away, leaving just his less salubrious qualities behind. However, Frost is probably too young. I don't mind ages being changed up a bit, personally, but you need some older guys in the Watch. The name Tom Hopper has been oft suggested for Carrot and it's hard to argue with. He's physically perfect - huge, muscle-bound, with an honest, open face. He's only really been in Merlin, and it's hard to gage from his role as Percival if his acting's up to a major role, but I certainly have to reason to doubt it. He also looks young enough. I think people forget sometimes how young Carrot is when he enters the Watch (only 16, I believe) and though I think Pratchett aged him up quite rapidly, I think he's only in his mid twenties by, say, 'Thud!'. Mackenzie Crook seems a natural fit for Nobby, although perhaps too tall. 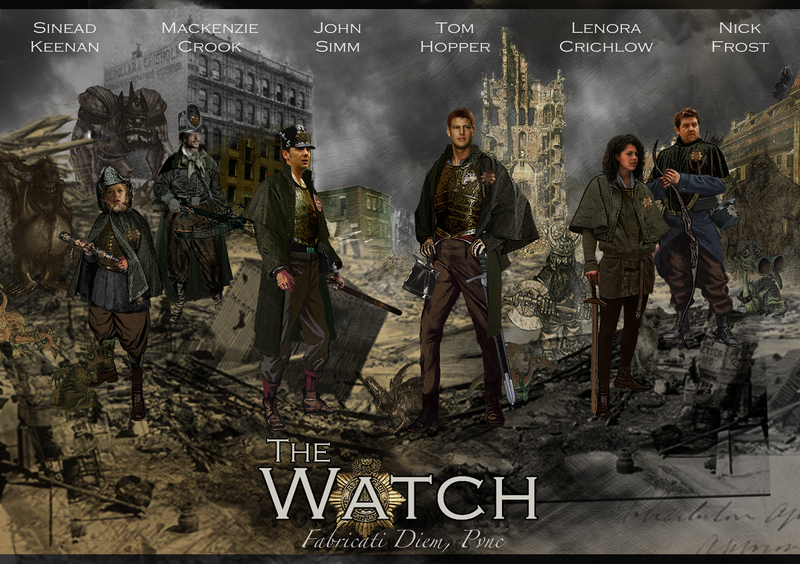 Cheery was a last-minute-ish addition to the picture, and she's there because I was pleased with her Watch/alchemist outfit (and because I didn't want the poster to be four-guys-and-the-chick) more than because of my casting choice. I think the 'Being Human' connection of Crichlow suggested Sinead Keenan to my limited faculties, and she certainly embodies the worried, bolshy sweetness of Cheery. It's doubtful you could make much of a 'reveal' of the fact she's female, no matter how big a beard you put on the actress, because her features a re so pretty and feminine. But she's a decent stand-in for the role in my imagination, anyway. I should mention I've liberally used Paul Kidby illustrations within the background. That was to add to the illustration/live-action/balance style, though also I knew from the start I wasn't going to be able to construct a semi-real representation of Detritus. He's essential - trolls in general are - to the Watch stories, but I really wonder how the actual producers are going to manage them in the event. I've got no problem with them altering the look of trolls to be more workable on screen, but if they look like guys in costumes, like the golems in the Going Postal miniseries... well, it's just a step away from the world being taken seriously and into camp fantasy. So: tricky.